The solution was to specify the right DNS servers in the DNS console. Select properties of the hub transport or the EDGE server. Make sure that the right DNS servers are specified by internal and external DNS lookups. 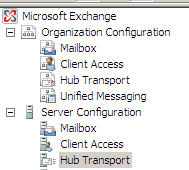 Finally restart the Microsoft Exchange Transport services and check out the application log. I found that the customer was not using DNS reverse lookup Zones and also an invalid DNS forwarder. I’ve created the correct Zones and removed the invalid DNS forwarder and the problem was gone.